In an era where the coffee market is undergoing phenomenal growth and the need to protect our environment is being strengthened, businesses are called to constantly innovate and offer more sophisticated products. 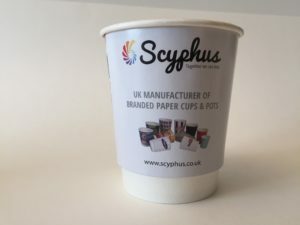 Since its creation, Scyphus has been acknowledged and hailed for its excellence in paper cup branding especially because branding has become more of a cultural icon than a simple marketing tool. Irresistible in its appeal, our line of branded biodegradable paper cups has been helping businesses enhance the level of customer satisfaction they offer to their own clients and subsequently improve their Return on Investment (ROI). As a leader in the market, we have the responsibility to give example by developing sustainable and affordable products without compromising quality. Our compostable paper cups, lined with polylactic acid (PLA) which is derived from renewable resources such as corn starch, are serving this purpose. 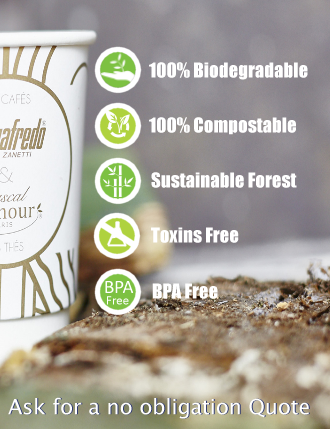 Hundreds of companies are continuing to incorporate our 100% biodegradable coffee cups, making their own customers happy and enhancing their brand image at the same time. Our eco-friendly paper cups can be easily composted alongside food waste and they can break down completely within 12 weeks, according to scientific research. PLA made from corn starch, also referred to as bioplastics, is furthermore safe for atopic consumers, containing no allergens. 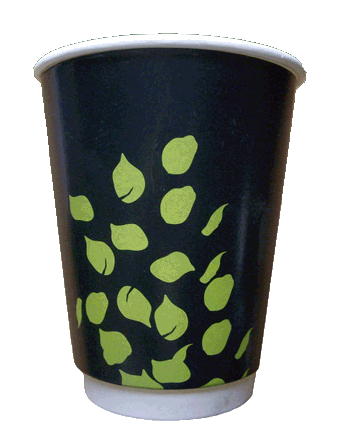 Food safe inks are also used for printing on all of our paper cups. Scyphus has chiselled a solid reputation for being extremely rigorous, comprehensively helping brands to rethink themselves when needed. Our range of compostable paper cups is perceived as an opportunity for businesses to expand themselves and enter the brand multiverse with poise while remaining true to their original identity. If our range of biodegradable paper cups is so much appreciated, it is because we have set precise criteria of five filters–100% UK manufactured, high-quality paper, sustainably sourced material, robust, and sophisticated. These filters reflect the core approach of our company itself, that is, to adopt a thorough approach to protect our environment while proposing 100% UK manufactured products of finest quality. Moreover, priding ourselves in our vast experience in the food and beverage industry, we have helped to invigorate existing brands and craft new ones. 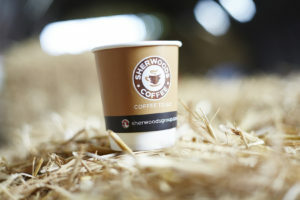 Under our guidance and by adopting our range of compostable paper cups, companies have witnessed dramatic growth spurts. While start-ups flourished, old existing companies find a way to stay relevant and authentic with our products. Branded to the identity of businesses, our biodegradable paper cups have helped companies deviating companies recapture their spirit. Our tailor-made products have also been considered as a milestone for various companies to reassess and redefine themselves. Vision has a vital role for a business, especially for coffee shops that are constantly under pressure to innovate and surprise their clients. At the same time, owners should understand that proposing a wonderful menu of coffee is not enough. It has to be coupled with quality side products. In an era where the majority of consumers are opting for on-the-go food items and beverages, branded biodegradable paper cups have an immense importance. Our compostable paper cups have unlocked the potential for growth for a myriad of businesses, especially coffee shops and food outlets. Today, nurturing the vision of simply selling the tastiest coffee or other beverage is not enough at all; brands should relentlessly work to craft and offer a complete brand experience. Every brand touch point should hence be accurately defined, engendering an emotional connection with consumers. The latter are more demanding than ever, seeking to experience an emotion through their cup of coffee. Studies have revealed that the majority of clients regularly consuming coffee would want to see coffee shops taking sustainability and environment protection at heart. They wish to see their sustainably sourced coffee beans served in equally sustainable products that will not harm their environment in any case and help in waste management. They are even ready to pay more for their coffee if it is served in 100% biodegradable paper cups. In the long run, clients feel connected with the brands that continuously offer them experiences that they want, desire, or need. Consumers are always happy and satisfied with products and experiences that can make their lives even a little better. This is why Scyphus helps brands sell experiences rather than products. By integrating our biodegradable paper cups that are made from high-quality virgin paper strictly sourced from PEFC and FSC Certified sustainable forests, businesses amp up their image. Our line of biodegradable coffee cups that can be scrupulously personalised help companies create a social network encouraging consumers to connect to a certain culture that it wishes to promote. By helping brands obtain their own perfect cup matching their ideals, Scyphus simultaneously offers them a differentiator that can act as a powerful tool in the coffee industry. Every brand has a story. It can be the story of the founder of the business or the reason behind its creation. Today, those companies that fail to tell their story fail to exist. The question is, how should a coffee shop tell its story? How should it make its identity and story recognisable at a glance? Scyphus brings the solution. Our team of design experts has been creating unique designs able to appeal to consumers at a glance. We have helped hundreds of companies find their perfect artful conception that can instantly visually compel and communicate with people. Our high-quality biodegradable paper cups- like a moving advertisement- allow brands to hand deliver their message and story to not only target audiences but to the public eye at large. Statistics show that this type of organic marketing is highly fruitful as people are inclined to shun traditional advertising strategies: just seeing a drinker walking with a cup bearing the design, logo or message of a brand can spark a conversation about the brand.